CBMBA is excited to announce we have joined Colorado Gives Day! Now, it’s your turn. Join in on 12.04.18! Colorado Gives Day is one of the largest one-day giving movements in the country. In 2017, Colorado Gives raised over $36 million for nonprofits on that one, single day! Colorado Gives Day energizes donors to connect to nonprofits they believe in, and it energizes nonprofits by providing much-needed funds to fulfill their missions. Learn more about Colorado Gives Day and CBMBA by visiting our profile. 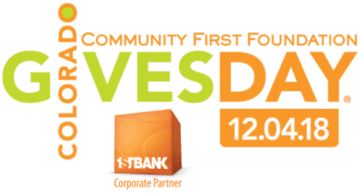 In addition, each dollar you give on Colorado Gives Day through ColoradoGives.org goes further because it is boosted by the $1 million Incentive Fund, created by Community First Foundation and FirstBank. Colorado Gives Day donations also make CBMBA eligible for additional cash prizes. All of this makes it so we can do more to get you out doing what you love on the trails! You can help us improve the trails, conserve landscapes, and build community by giving on December 4, scheduling your gift now, and/or sharing the information with your people. Add Colorado Gives Day to your Calendar so you don’t forget to give! Or, schedule your gift now so it’s all taken care of! Follow this link to CBMBA’s Donation page. Select or enter your donation amount. Under Donation Frequency, choose the option “CO Gives Day”. This will schedule the donation to process on Dec. 4 and make it eligible for the boosted funds. Complete additional fields and click “Add to Cart”. When ready, click “Proceed to Checkout”, follow the steps until you click “Submit”. Share this email or post to social media using the attached “I Gave Early” Badge to let others know that they, too, can support CBMBA on Colorado Gives Day, December 4, 2018. Thank you for helping CBMBA host community rides, maintain our beautiful trails, and build new trails to better connect our community, and to connect you with the lands you love!